Palmitoylated PSD95 is detected by immunocytochemistry using anti-PSD-95 (palmitoylated), mAb (rec.) (PF11) (Prod. No AG-27B-0021). Method: HeLa cells were cotransfected with DHHC2 (palmitoylating enzyme) + PSD95-GFP (A) or DHHC2 (palmitoylating enzyme) alone (B). Cells in "B" were fixed with paraformaldehyde (3%), permeablized in PBS+ BSA 0.2 % + Saponin 0.05 % and incubated with anti-PSD-95 (palmitoylated), mAb (rec.) (PF11) (1µg/ml in PBS-BSA-Saponin). 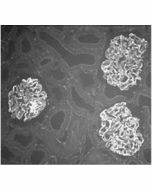 After incubation for 30min at RT and several washes in PBS, cells are treated with a goat anti-human (ATTO488) antibody in PBS-BSA-Saponin for 30min at RT, washed and mounted in Moewiol. Nuclei are stained with DAPI. Merge image is shown at the right. Picture courtesy of Dr. Moutel, Dr. Franck Perez Lab, Curie Institute, Paris. Structure of the recombinant antibody anti-PSD-95 (palmitoylated), mAb (rec.) (PF11) (AG-27B-0021). The single chain variable human fragment (ScFv) selected by antibody phage display technology and specific to the antigen of interest is fused to a human IgG2 Fc region. Recognizes human, mouse and rat palmitoylated PSD-95. Liquid. In PBS containing 10% glycerol. anti-PSD95 Palmitoylated, mAb (rec.) (PF11) is composed of human variable regions (VH and VL) (λ-chain) of immunoglobulin fused to the human lgG2 Fc domain. PSD-95 is a member of proteins located at a specialized postsynaptic membrane region, called the postsynaptic density (PSD). PSD-95 is the most abundant scaffold protein specifically enriched in the PSD. It contains three PDZ domains, an SH3 domain and a guanylate kinase (GuK)-like domain. Through its PDZ domains, PSD-95 assembles various synaptic components at the PSD including intracellular signaling molecules (e.g. SynGAP and kalirin-7), ion channels (e.g. stargazin/AMPA receptors [AMPARs] and NMDA receptors) and cell adhesion molecules (e.g. neuroligin). PSD-95 plays a primary role in synaptic development and maturation and is regulated by palmitoylation at its N-terminal cysteine residues leading to its postsynaptic targeting. Palmitoylation of PSD-95 is triggered by DHHC2, a plasma membrane-inserted palmitoylating enzyme. Palmitoylated PSD-95 is almost exclusively localized at excitatory synapses in neurons.